Reference number for this case: 11-oct-54-Acquigny. Thank you for including this reference number in any correspondence with me regarding this case. Aimé Michel mentions that there was a case of landing in Acquigny on October 11, 1954. Oct. 11, 1954, 0300, Acquigny (France). Two men riding motorcycles saw a bell-shaped craft about 2.5 m high, hovered 1 m above the Evreux-Louviers railroad line. The lower part was ringlike, and the object gave off reddish and greenish sparks. A burst of orange light was seen as it jumped about 10 m high, then it remained motionless for about 1 hour, during which time a third witness joined the first two. It ultimately turned brighter and flew away toward the east. (France-Soir, Le Figaro, 14 oct 1954) (55; M 162). 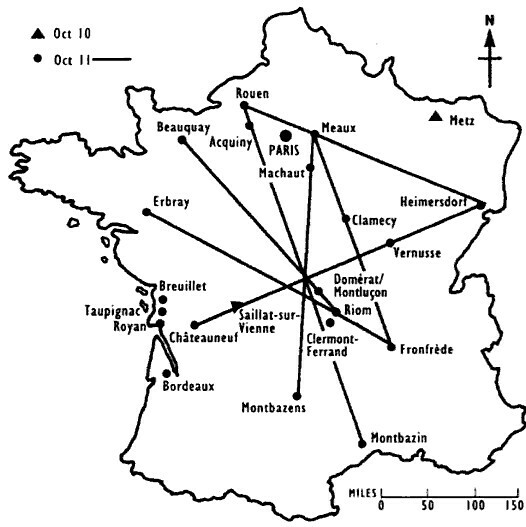 The author indicates that on October 11, 1954, two men riding a motorcycle saw, approximately 3 hours of the afternoon, close to Acquigny, on the rails of the railroad Evreux-Louviers, a machine whose form recalled that of a bell of approximately 2 m 50 height and to 1 meter about of the ground. Its lower part was like a ring, and the object projected reddish and greenish sparks. An explosion of orange light is observed when the UFO rose suddenly of approximately 10 meters, then remained motionless in the air. This lasted approximately an hour, time during which a third witness joined the two first. The UFO finally became more brilliant and flew away in direction of the east. In a catalog of observations in the department of Creuse, a brief record relates to this case. Nothing particular appears in it, it compares totally to Vallée's sumary above and thus seems to be a simple copy of it. The two authors indicate that according to an A.F.P. dispatch and their personal files, on October 11, 1954 around 3 hours of the morning, a craftsman and his apprentice, travelling by motorbike, saw on the railway Evreux-Louviers a craft stationed at ground level, or resting on short crutches. The witnesses said that it had the shape of bell, with its lower part resembled a ring, and emitted greenish and reddish sparks. A farm labourer, who went to his work joined these two men and all three observed the thing during more than one hour. The orange gleam which lit it then became sharper, the machine initially made a jump of ten meters, then rose quickly vertically, taking the direction of the East. The two authors indicate that in Acquigny in the Eure on October 11, 1954, at 03:00 a.m., a craftsman and his apprentice who circulated by motorcycle saw on the railway Evreux-Louviers a machine in the shape of a bell of 2,50 meters by 3 meters in height, being 1 meter above the rails. The lower part of the machine had the shape of a ring. This object emitted sparks with greenish and reddish reflections. It made a jump from 10 to 12 meters, while spouting an orange gleam out of its base. A farm labourer joined the two witnesses, and they observed this apparatus during one hour. Then the orange gleam became sharper, and it rose very quickly vertically and took the direction of the East. The sources are listed as the Vallée catalogue, case 231, Garreau and Lavier in "Face aux ET" page 47, France-Soir, La Croix, Le Figaro for October 14, 1954, and Quincy. Two men riding motorcycles saw a bell-shaped craft about 2. 5 m high, hovered 1 m above the Evreux-Louviers railroad line. The lower part was ringlike, and the object gave off reddish and greenish sparks. A burst of orange light was seen as it jumped about 10 m high, then it remained motionless for about 1 hr, during which time a third witness joined the first two. It ultimately turned brighter and flew away toward the east. Donald Johnson indicates that on October 11, 1954, two men riding motorcycles near Acquigny, France saw a bell-shaped craft about 2.5 m tall while it hovered just a meter above the Evreux-Louviers railroad line. The lower part was ringlike, and the object gave off reddish and greenish sparks. A burst of orange light was seen as it jumped about 10 meters high, then it remained motionless for about one hour. During this time a third witness joined the first two. The UFO ultimately brightened and flew away toward the east. The source is noted Jacques Vallee, Passport to Magonia: A Century of Landings, p. 224. Jerome Beau indicates that on Monday, October 11, 1954 at 03:00 in Acquigny, France, "2 people driving by motorbike see 1 object in the shape of a bell, of approximately 2,50 m in height, hovering at 1 m above the railway line from Evreux to Louviers. The lower part resembles a ring, and the object releases reddish and greenish sparks. A dazzling orange light is seen whereas it rises to 10 m, then it remains immobilized during 1 H. During this time, one 3rd witness joint with the 2 first. The object becomes more brilliant and flies away towards the east." Jérôme Beau indicates that the sources are France-Soir, Le Figaro, October 14, 1954. Luc Chastan indicates that in the Eure in Acquigny on October 11, 1954, at 03:00 hours, a craftsman and his apprentice who drove by motorbike see, on the railway from Evreux to Louviers, a craft in the shape of a bell of 2,50 m to 3 meters in height, being 1 meter above the railway. The lower part of the machine has the shape of a ring. This object emits sparks with the greenish and reddish reflections. It makes a jump from 10 to 12 meters, while an orange gleam spouts out of its base. A farm labourer joins with the two witnesses, they observe this apparatus during one hour. Then the orange gleam becomes sharper, and it rises very quickly vertically taking the direction of the east. Michel Padrines indicates that in the Eure in Acquigny on October 11, 1954, at 03:00 hours, a craftsman and his apprentice who drove by motorbike see, on the railway from Evreux to Louviers, a craft in the shape of a bell of 2,50 m to 3 meters in height, being 1 meter above the railway. The lower part of the machine has the shape of a ring. This object emits sparks with the greenish and reddish reflections. It makes a jump from 10 to 12 meters, while an orange gleam spouts out of its base. A farm labourer joins with the two witnesses, they observe this apparatus during one hour. Then the orange gleam becomes sharper, and it rises very quickly vertically taking the direction of the east. Michel Padrines indicates that sources are France-Soir, Le Figaro, October 14, 1954. The website indicates that on 11 October 1954 at 03:00 in Acquigny, France, a bell-shaped craft about 2.5 meters high was seen. Two men riding motorcycles saw a bell-shaped craft about 2.5 meters high, hovered one meter above the Evreux-Louviers railroad line. The lower part was ring like, and the object gave off reddish and greenish sparks. A burst of orange light was seen as it jumped about ten meters high, then it remained motionless for about one hour, during which time a third witness joined the first two. It ultimately turned brighter and flew away toward the east. The website comments: "An object was observed. Animal reactions to the object were reported. One green-orange star, about 5 feet across, was observed by three male witnesses on a farm for over 60 minutes (Labonde)." [Note: "Labonde" has nothing to do with this case; see Lacanche case]. *Oct. 11, 1954 - At 3:00 a.m. two men riding motorcycles near Acquigny, Eure, France saw a bell-shaped craft about 2.5 meters tall while it hovered just a meter above the Evreux-Louviers railroad line. The lower part was ringlike, and the object gave off reddish and greenish sparks. A burst of orange light was seen as it jumped about 10 meters high, then it remained motionless for about one hour. During this time a third witness joined the first two. The UFO ultimately brightened and flew away toward the east. (Sources: Aime Michel, Flying Saucers and the Straight Line Mystery, p. 162; Jacques Vallee, Passport to Magonia: A Century of Landings, p. 224, case # 231). [rc1] Palmarès des Observations dans l'Eure", compiled by Rober Crépin, regional delegate for LDLN, in the ufology magazine Lumières Dans La Nuit (LDLN), France, #259-260, page 39, January - February 1986. [gl1] "Face aux Extra-Terrestres", book by Charles Garreau and Raymond Lavier, Delarge publisher, France, J'ai Lu, page 47, 1975. [fr1] "OVNI, Premier Dossier Complet des Rencontres Rapprochées en France", book by Michel Figuet and Jean Louis Ruchon, Alain Lefeuvre publisher, France, pp 146-147, 1979. 0.2 Patrick Gross April 15, 2008 Conversion from HTML to XHTML Strict. 1.0 Patrick Gross December 20, 2008 First formal version. Additions [am1], [dj1], [lc1], [jb1], [mp1], [ud1]. 1.2 Patrick Gross September 26, 2014 Additions [ad1], [ni1].